THE AVERAGE woman in Niger has seven children. The average South Korean has barely one. The future size of the world’s population depends largely on how quickly child-bearing habits in places like Niger become more like those in South Korea. If women in high-fertility countries keep having lots of babies, the number of people will keep swelling. The sooner they curb their fecundity, the sooner it will peak and start falling. The UN projects that fertility will fall gradually and that lifespans will increase, so the world’s population will rise from 7.7bn today to 11.2bn by 2100. (This is its best estimate; the UN says it is 95% confident that the true figure will lie between 9.6bn and 13.2bn.) Opinions are divided over the effects of such growth. For some, a more crowded planet will be an environmental disaster. For others, those billions of extra brains will help humanity devise ever more cunning solutions to its problems. Nearly all rich countries have sub-replacement fertility rates: the OECD average is 1.7. Middle-income countries are close, at 2.3. Only in poor countries is fertility still high enough to fuel rapid population growth. In sub-Saharan Africa it is 4.8; in “heavily indebted poor countries” (as the World Bank calls them) it is 4.9. Pre-industrial fertility rates persist only in the poorest parts of the poorest countries. The decline in fertility in Africa was recently smaller than expected. If this is a long-term trend rather than a blip, then the world’s future population will be much larger than today’s. But Wolfgang Lutz, a demographer at the International Institute for Applied Systems Analysis in Austria, argues that it is indeed a blip. It happened because spending on education stalled during the 1990s. Many women born around 1980 received less education than the previous generation. The UN extrapolates from past trends, so the stalling in Africa makes its model predict higher fertility far into the future. However, the decline in education has reversed. 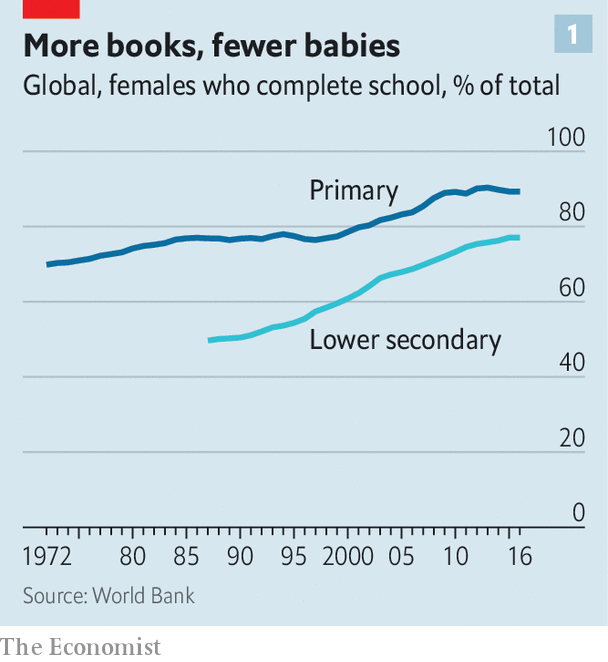 The long-term trend is for ever more women to complete a basic education (see chart 1). After a lag (since schooling starts several years before puberty), this should allow fertility to resume its downward slide. Models that take education into account produce wildly different projections. Mr Lutz and his team have produced a range. If progress in education and other social indicators stalls, the global population will be 12bn by 2100. If current progress continues, it will peak at 9.4bn in 2075 and then fall to 8.9bn by 2100. If progress is a bit brisker, the world’s population will peak at around 9bn and decline back to 7bn—today’s level—by 2100 (see chart 2). These estimates are based on three scenarios devised by climate-change wonks. 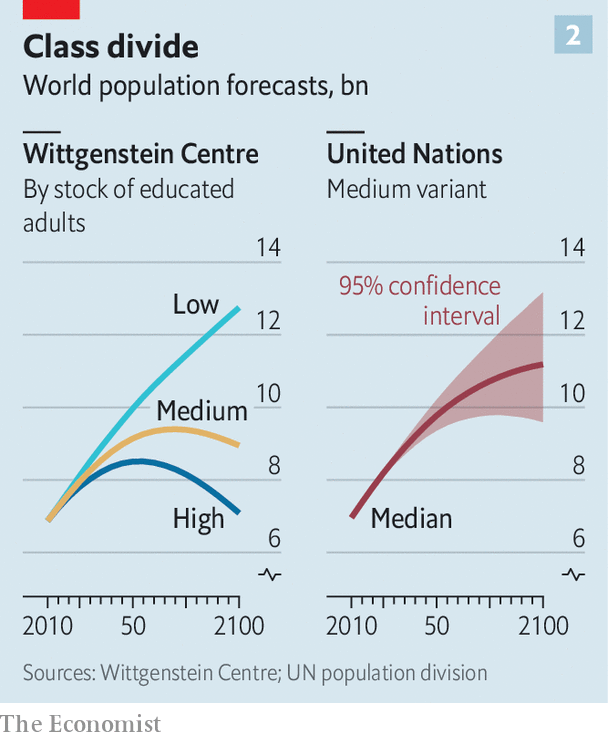 Both the medium and optimistic ones are significantly lower than the UN’s 95% confidence range. To assess whether this is plausible, it is important to understand why some women have lots of children and others very few. A good way to start is to ask them. Oumou Nyero lives in Torodi, a rustic district in Niger. She has had eight children, one of whom died. Though tragic, this is not unusual in rural Niger, where nearly one child in six dies before the age of five. Ms Nyero is 43 and assumes that her child-bearing days are over, unless God wills it. She is Muslim, conservative and veiled. Yet she is happy to discuss procreation, smiling and giggling as she does so. Giving birth eight times was not easy. Asked if any of her children were twins, Ms Nyero grins, raises her forefinger and says: “No. One. One. One. One.” At every “one” she waves her finger around and puffs out her face to emphasise how hard it was. She is intensely proud of her brood—three surviving boys and four girls, aged between two and 21, and delighted that there are so many of them. “It is very, very important to have children,” she says, sitting on a wicker chair in the shade of a dusty tree. There are intangible benefits, too. For a woman, “it raises your value if you have more [children],” says Ms Nyero. “If you have many, even the friends of your children pay you respect.” By contrast, a failure to breed carries a social stigma. In rural Niger, a woman is not considered an adult unless she has children, observes Alison Heller of the University of Maryland, the author of “Fistula Politics: Birthing Injuries and the Quest for Continence in Niger”. In parts of the country, women whose children all die are known as wabi, meaning a tree whose fruit falls off without ripening. Ms Nyero adds with a chuckle that she pities childless people, such as the correspondent from The Economist interviewing her. Her approach to child-rearing is loving, fatalistic and far removed from the “helicopter parenting” so common in rich countries. Asked where her two-year-old son is, she grins nonchalantly and looks around the yard. “He was around playing here, but he has wandered off into the fields,” she shrugs. 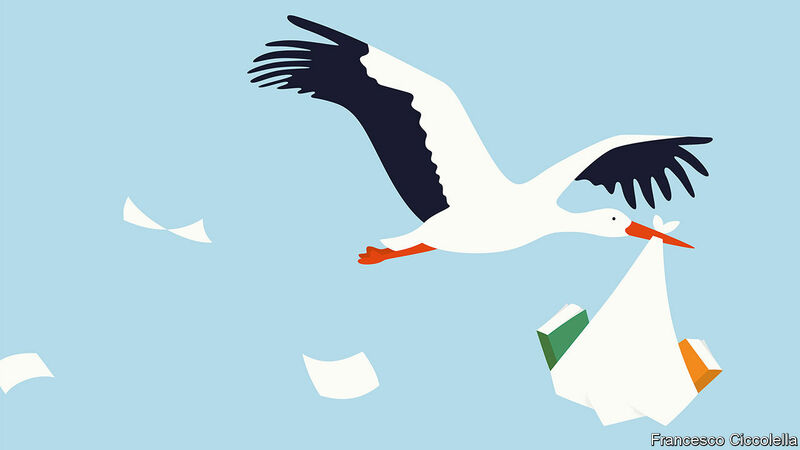 For people in rich countries, the economics of child-rearing are different. Rather than start earning at the age of five, the little darlings consume huge amounts of time, resources and parental attention for at least the first 18 years, and possibly far longer. Instead of putting them to work in the fields, their parents try to cram them with education, hoping they will get into a good university and eventually land a good job. All this is costly, so they can afford to do it only once or twice. She is vastly richer than Ms Nyero, but finds even one child a financial strain. She moved in with her parents elsewhere in the country for five months after the birth, because she and her husband could not afford an apartment big enough for three in Seoul, where the average home costs $640,000. “We lived in a small studio flat, which was just about fine for the two of us, but it would have been miserable raising a child there,” she says. Raising seven children in a mudbrick home with no running water, as Ms Nyero does, is hard to imagine. Whereas people who are hungry think only of food, those with full fridges crave less tangible things: a fulfilling career, a spouse who is also a soulmate, quality time with each individual child. Ms Nyero never so much as mentions any of these first-world luxuries. For Ms Chung they are important—but also hard to combine with having lots of children. Ms Chung has now moved back to Seoul. Her husband has found a new job with a broadcasting company that lets him get home at a reasonable hour every night. This is unusual in South Korea, where male white-collar workers are expected to put in punishing hours and then go drinking with colleagues. The husbands of Ms Chung’s friends are rarely home before midnight. The pressure on South Korean mothers is unusually intense. Their bosses often assume that they will quit. Employers are legally obliged to offer 12 months of maternity leave, but often find ways to avoid it, complains Ms Chung. The average Korean husband does far less child care or housework than his Western peer. Moreover, the competition to get one’s children into the right university is ferocious. Families spend a fortune on cram schools, despite attempts by the government to restrict them. Mothers spend hours nagging their children to study and preparing snacks so they can stay longer in the library. Ms Chung wants her son to have the best education possible, which will be horribly expensive. She would like more children but doubts that would be compatible with her desire to go back to work. Also, if she had several kids she could not afford to educate them properly, she says. Some young South Korean women go further, and say that even one child is too many. “I look at my mother and how she’s sacrificed everything and people don’t even notice. I don’t want my life to be like that,” says a 22-year-old student in Seoul. South Korea is an extreme example, but women in other rich countries make the same basic calculation. Instead of starting to have babies shortly after they reach puberty, as women have done throughout history, they postpone motherhood until they have spent years in education and then established themselves in a career. If they have children, they typically have only one or two, because giving them the best start in life is expensive. They assume, with good cause, that none of their offspring will die young. Women in middle-income countries (ie, most women) behave a lot like women in rich countries, which is why their fertility rate is but a whisker above the replacement level. In China, the norm of having just one child has become so ingrained since the one-child policy was introduced in 1979 that even after its progressive relaxation in recent years, the birth rate has continued to fall. Officially, the fertility rate is 1.6, but some demographers suspect it is actually lower. In India, which is far poorer, the rate is nonetheless only 2.3. The big question-mark hangs over women in poor, high-fertility countries. By 2025 only 1% will live in places where the fertility rate is above 5.0; however, a hefty 32% will live in places where it is between 2.1 and 5.0, predicts the UN. Some people argue that having big families is part of the culture of such places and unlikely to change. Many locals would agree, and their religious leaders would add that God wants them to multiply. But a similar “cultural” preference for large families once prevailed almost everywhere and has changed beyond recognition. So there is no reason to assume that it is immutable. Several factors correlate strongly with smaller families. One, as mentioned, is income. Another is urbanisation. Probably the most important, however, is educating girls. The more years they spend in school, the fewer babies they have. This is hard to disentangle from the other two—richer countries tend to be more urban and to educate girls better. And it is theoretically possible that causality could flow the other way—women who get pregnant as teenagers may be forced to drop out of school. But this effect is likely to be small. When researchers look only at the education that girls receive before they become sexually mature, they still find that more years in school means fewer babies later in life. That suggests that learning reduces fertility, not the other way round. A truckload of academic studies supports this argument. 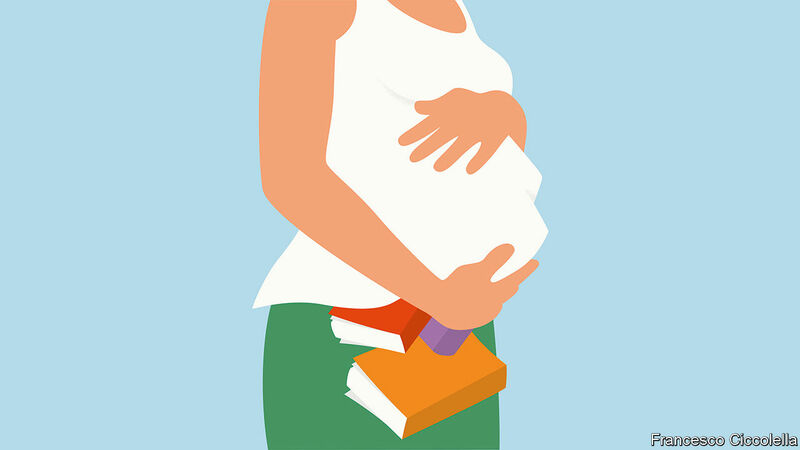 Education reduces fertility by giving women other options. It increases their chances of finding paid work. It reduces their economic dependence on their husbands, making it easier to refuse to have more children even if he wants them. It equips them with the mental tools and self-confidence to question traditional norms, such as having as many children as possible. It makes it more likely that they will understand, and use, contraception. It transforms their ambitions for their own children—and thus the number that they choose to have. Education also takes a long time. A woman who studies until she is 25 and then spends ten years building a career has just a few years left to get pregnant before she no longer can. Technology may someday remove this constraint, but for now it is hard to have eight children unless, like Ms Nyero, you start early. The difference that education makes is especially notable in countries where fertility has only just started to fall. In Ethiopia, for example, a household survey in 2005 found that the fertility rate for women with no formal schooling was 6.1; for women with secondary education or more, it was only 2.0. Educating girls better is one of the few goals that nearly every government agrees is important. So it would be surprising if the girls of the future were worse educated than today’s. The proportion worldwide who complete primary school has risen from 76% in 1997 to 90%. The last mile may be the hardest, but there is no doubt what parents and voters want. A transition that took 200 years in the West, from seven children to two, can now take place astonishingly fast. When rural folk move to the city, it can happen in a single generation. Consider Dorothy Achieng, a 29-year-old receptionist at an accountancy firm in Nairobi. Her mother had eight children, one of whom died. Dorothy has two. Whereas her mother could barely read and put her older children to work on a small family farm, Ms Achieng hopes to keep hers in school. Ms Achieng is typical of those who move from the countryside to the city. The rural fertility rate in Kenya is 4.5; the urban one, 3.1. Most of Ms Achieng’s friends, like her, have far fewer children than their parents did. No one she knows has seven or eight children. Although she lives in a slum and has no running water in her modest two-room flat, Ms Achieng is part of the aspiring middle class. Indeed, on her salary of just $200 a month, she pays for a private school that costs $50 per child, per term. It is a strain, but she thinks it is worth it. She does not plan to have more children. If she did, she says, she could not “give them the best”. Previous PostPrevious Why do terrorists claim credit for some attacks but not others?